A week or two ago Nvidia published its latest set of financials. The results were good, with revenues and profits topping estimates and the Nvidia CEO Jensen Huang commenting "We had a great quarter across all of our growth drivers". Specifically in gaming, we learned that Nvidia enjoyed 32 per cent QoQ and 25 per cent YoY growth in revenue to rake in $1,561 million in the most recent quarter. However, we didn't hear data about units shifted and market share but luckily Jon Peddie Research has just published a report on such matters. From an overview published by JPR we learn that North America, Western Europe and Asia Pacific saw a high-end GPU growth rates of 5.78 per cent, 6.63 per cent and 9.61 per cent respectively. A JPR analyst said that the PC platform continues to be very strong for gaming as it delivers; increased graphical detail, improved control, flexible customisation in both software and hardware, countless accessories, and the backing of eSports. JPR noted that the PC's aspirational and flexible qualities helped precipitate growth in all tiers, but especially at the high-end (see chart below). 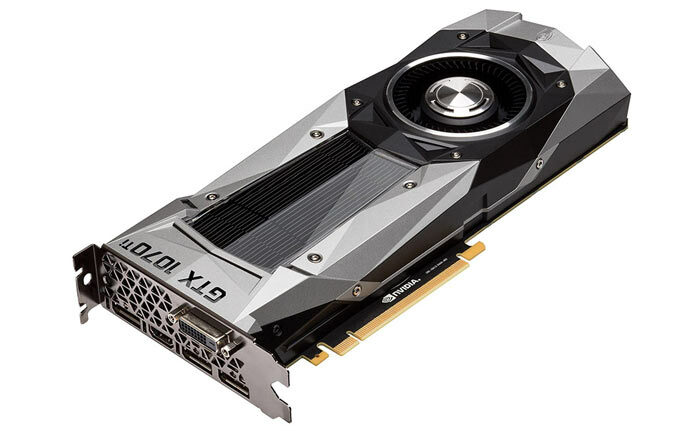 Tech site VentureBeat has leafed through the new JPR report and unveiled some further interesting nuggets about the state of the graphics card market. GPU attachment rates were up in Q3 2017, with 39.55 per cent of all PCs shipping with discrete GPUs, that's up 4.18 per cent. While AMD didn't grab the headline for this story it still grew. "AMD's shipments of desktop APUs, increased 7.1 per cent from the previous quarter," According to the JPR report. "AMD's notebook APU shipments were up 2.2 percent. Desktop discrete GPUs increased 16.1 per cent from last quarter, and notebook discrete shipments increased 5.2 per cent. AMD's total PC graphics shipments increased 7.6 per cent from the previous quarter." Likewise Intel enjoyed a seasonal boost, with its integrated GPU sales growing 5 per cent in desktops and 5.9 per cent in laptops. Nvidia's performance widened the gap between it and rivals AMD and Intel. According to the latest data, the green team surged ahead with discrete desktop GPU shipments up 34.7 per cent from last quarter, and discrete laptop GPU shipments up 22.4 per cent. Nvidia's total PC graphics shipments increased 29.5 per cent from last quarter. With the above competitive landscape in focus it looks like AMD and Intel's partnership in integrated graphics is a canny move to turn the tide which has been flowing in Nvidia's favour for so long. I really am beginning to despise the people at AMD's RTG for their shambles & failure of a GPU, Vega. Their total incompetence in bringing a competitive GPU to market is costing us all dear. The uArch that the Vega GPU chips are based off is revolutionary, and is leagues ahead of NVidia's Pascal (at least the Pascal that's present in GeForce. I haven't had a chance to work with the Quadro cards - way too expensive for what they are). I have to wonder if the Vega uArch lends itself better to being smaller chips (1024 - 2048 cores) clocked a little slower, but with many chips packed together on Infinity Fabric (cheaper, more cores, lower power consumption). Maybe the big, fast, hot Vega GPUs we have is just a stop-gap before Navi is released and we get to see it really shine? Either way, the technical advances that Vega brings are pretty damn exciting and we should consider ourselves lucky we still have some competition in the market to enable this. I agree that NVidia are fleecing PC gamers right now, but it won't remain like that for long. If their GPUs are too expensive, then just don't buy them (my view for the last 3 years). 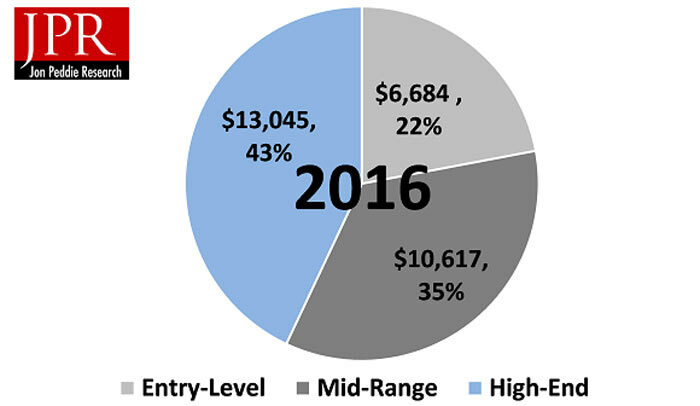 Intel graphics market share decreased. AMD and Nvidia gained more marketshare in a market which had more sales than the last quarter. That means more people are buying dGPUs for their systems and I suspect it is down to Ryzen probably not having an IGP,and more Intel systems using a dGPU. GPU attachment rates were up in Q3 2017, with 39.55 per cent of all PCs shipping with discrete GPUs, that's up 4.18 per cent. That indicates AMD desktop APU shipments have probably crashed,otherwise their marketshare would not have been flat. So AMD and Nvidia have both increased dGPU sales,at the expensive of Intel but Nvidia got more of them,and I suspect a lot of the increase might even be down to Ryzen,as the Intel drop is nowhere as big as the increase in BOTH AMD and Nvidia sales. AMD would need RavenRidge to get picked up heavily in bulk orders with the likes of Dell and Fujitsu etc; I wonder if Intel are still pulling shady deals to block that. Also, with the IGP deal with Intel at least they'll get something, though it kind of feels like AMD are hobbling RR before it has a chance.